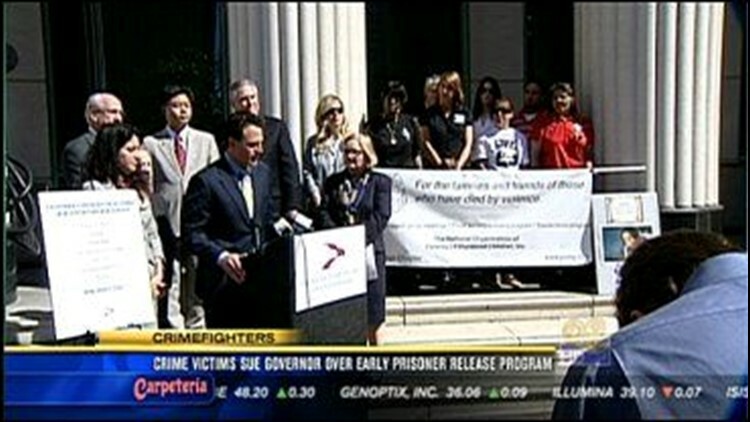 (CBS 8) - A coalition of crime victims is suing the governor and California's Department of Corrections over the early release program. A California group says a program authorizing the release of approximately 6,500 prison inmates in California is unconstitutional. Assemblyman Jim Nielsen can't believe after the early prison release of John Gardner and the suspected murder of Chelsea King, the state still wants to release thousands of prisoners. "Why do we have to wait and react to tragedy?" Nielsen said. Senate Bill 18 would release 6,500 inmates this year and could save the state $100 million. Nina Salarno with Crime Victims United of California says the state's classification of a low-risk offender would shock you. "Domestic abuse is considered non-violent, child, elder abuse, manslaughter is considered non-violent in the state of California," Salarno said. But the corrections department tells News 8 inmates will have to earn an early release by completing rehabilitation program that reduce sentences up to six weeks a year. They say fewer inmates means more resources to watch violent parolees. "This law allows us to focus our resources and to have reduced case loads of agents now working those that are more serious and violent individuals so they can watch them better monitor them more closely, supervise them more closely. But the lawsuit alleges Senate Bill 18 violates the state's constitution. In 2008, more than 6 million voters passed Marsy's Law, the victim's bill of rights that prevents early release due to prison overcrowding. "Releasing dangerous criminals before they have paid their debt to society and have been properly rehabilitated fails the people of California," Fletcher said. Both Republicans and Democrats who spoke today admit the state has a financial crisis and prisons are overcrowded, but they oppose a plan that they say compromises public safety to solve the problems. "I've talked to law enforcement officials up and down this state and all of them tell me without exception they are going to be overwhelmed when this early release of prisoners happens. It's just unacceptable," Sen. Tom Harman (R-Huntington Beach) said. So what's the solution to overcrowding? The group that filed this lawsuit says build more prisons. They say the state has more than $1 billion to spend from Assembly Bill 900 that hasn't been tapped into.